With 17,000+ employees, it’s good business practice for Nationwide to provide great places to work: ones that promote high levels of staff attendance and wellbeing. Its Workplace Adjustments Service aids employees with medical conditions, and reduces workplace barriers for people with disabilities. Our ergonomics specialists ensure the effectiveness of Nationwide’s Workplace Adjustments Service, by providing highly specialised and individualised support for employees. Our input helps Nationwide to provide workstations that go above and beyond minimum legislative requirements. We undertook individual assessments with employees experiencing musculoskeletal discomfort. This process relied on our comprehensive knowledge of all Nationwide’s working environments, its equipment and systems, and the job roles employees undertake. For some cases initial assessments could be made by phone, minimizing costs. More complex issues demanded face-to-face assessment in each employee’s workplace. Our consultants provided practical and, where possible, easy to implement recommendations. Their assessments ensured that staff comfort was optimised: employees gained the equipment, competence and confidence to work comfortably. In our experience, individual assessments cannot be entirely avoided by good initial design. 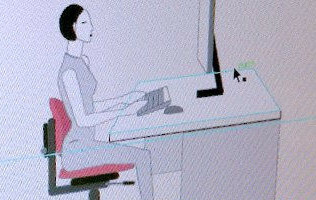 However, a low rate of assessments is an indicator of good ergonomics practice being in place. Our team’s involvement went beyond the assessments, collaborating with Nationwide’s attendance and wellbeing team to drive a continuous improvement process and optimal workstation design for the majority of the workforce. At Nationwide, over 80% of those employees who had undergone an ergonomics assessment, reported that they felt physically better, or much better, as a result of our help. Read our case study on how we helped Nationwide improve its branch design and work processes.